I was the happy recipient of some coconuts from a friend’s yard last week. I’m a big fan of coconut water, and buy it by the case. I love shredded dried coconut in my oatmeal and my granola. But I haven’t had a slab of real coconut meat in years and years. As a child, I spent the summers in Italy. My family would spend several weeks at the beach in Riccione on the Adriatic coast. Among the many tasty treats the tanned vendors would sell were pieces of raw coconut, soaking in big buckets of water. Coco! Coco bello! they’d cry, as they walked up and down the beach, heavy buckets splashing with every step. I admit: I’ve seen plenty of whole fuzzy coconuts with their funny O-mouthed faces, but never actually opened one up to get to the tasty meat inside. Watching friends go at it, it always seemed like quite a production. Messy and a little violent, what with the whacking with a hammer and all. So when my friend gave me these coconuts, I was a little intimidated. Luckily, she shared with me her favorite way to open them easily. Phew. Whacking averted for now. First, drill a hole in one of the three black spots, stick a straw in there and drink up all the delicious, mineral-rich coconut water. Did you know that coconut water replaces electrolytes in your body efficiently and naturally? It’s like the original Gatorade with none of the yukky artificial colors! When you can’t get any more through the straw, just invert the coconut over a glass so the rest of the coconut water can drain out of the drill hole. Next pop the coconut in the oven and set to 300. Bake it for an hour. The coconut should crack naturally around the middle, making it easy to pry open with a knife. Once you’ve got your two halves separated, carefully pry the meat away from the shell. This takes a little while so settle in and be patient. It’s worth it. Discard the shell. There will be a thin layer of shell attached to the white meat, which you can cut away if you choose. Personally, I just eat it. More fiber. Less work. 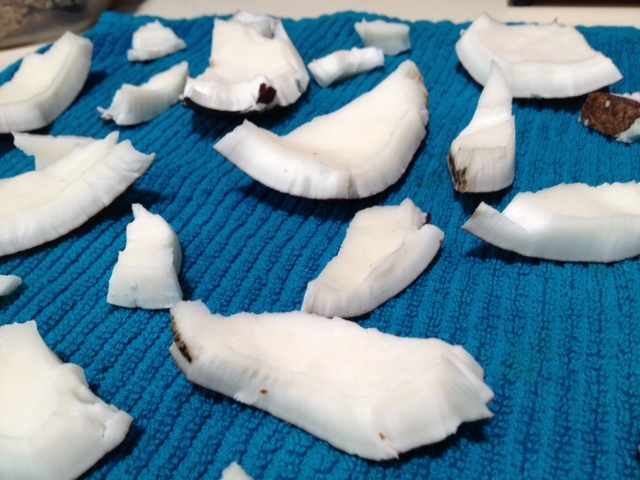 Rinse the creamy white coconut pieces in water to remove any debris and enjoy just like that. Or shred them and dehydrate. This is how I’m squashing my chocolate craving tonight. While this recipe considers the buckwheat optional, I chose to add it as a tribute to my partly Russian roots, and to give a little extra crunch. My Russian acupuncturist once bought me a bag, telling me it is high in iron and B vitamins, and iz gooood toooo noooorish blaaaahd. And by now you already know how much I love the humble chia seed, bursting with fiber and omega goodness. Need I even say anything at all on how I feel about chocolate? It borders on obsession. The darker the better, like 70% or higher. Here I used the standard 60% bittersweet chips, a la Nestle. Because they have some sugar, I do not use any additional sweetener. If you choose to use darker chocolate, feel free to add a squirt of raw honey or agave. Line a muffin pan with muffin liners and set aside. Roughly chop banana and mash into melted chips. Stir remaining ingredients into chocolate banana mixture and stir well until oats are coated with chocolate. Spoon mixture evenly into twelve muffin liners and freeze for about an hour, or until firm. You can leave these in the freezer and they will stay somewhat chewy, not freezing up to a completely solid state. They definitely squash my chocolate fix any time of day or night. Usually night. Late at night. Like now. Nothing gets Ecogirl’s wheels turning like food. She makes food out of Play-Doh. She adores her toy kitchen. She loves to “bake” cupcakes on a certain kiddie app on my iPad. 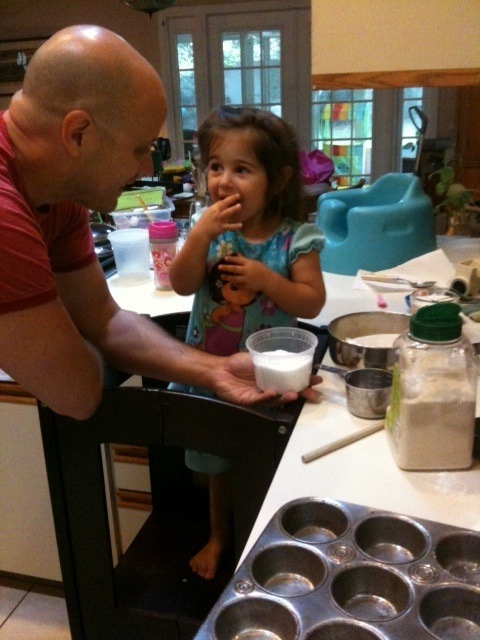 But doing a real live project in the kitchen … now that is her idea of a little piece of heaven. Ecodaddy has been home sick for a couple of days, and is getting a bit cabin feverish. 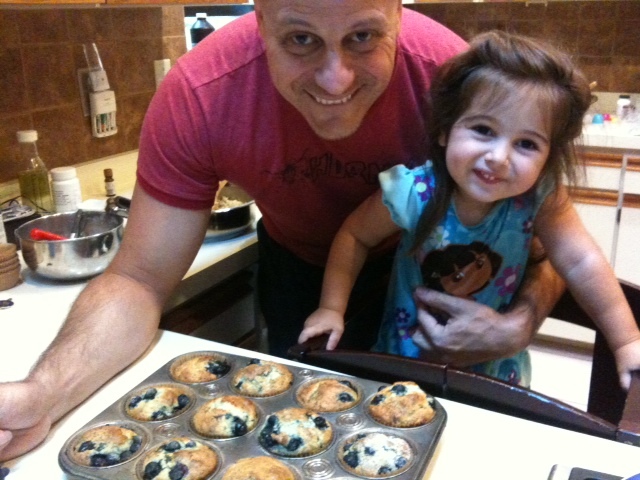 Today, he rallied just enough energy to volunteer to bake blueberry muffins with Ecogirl. She was overjoyed, and totally enraptured every step of the way. These muffins are light and fluffy, and the yogurt really contributes to how tender, moist, and delicious they are. I’ll be honest though: this is a fairly “mainstream” recipe, with white flour and sugar (we used organic flour and organic evaporated cane juice), inspired by Alton Brown’s recipe. Sidenote: Since I’m on Stage 1 Candida Diet at this point, I can’t actually taste them. No sugar, wheat or dairy, and this one is guilty on all three counts. I’ll tell you this much though: they made the kitchen smell really good. Really really good. So good in fact, that I threw nutrition caution to the wind and allowed Ecogirl to have two of them, buttered, in lieu of dinner tonight. Now that’s a good muffin! This yummy sweet green treat was inspired by Earth Baby Yoga Mama. 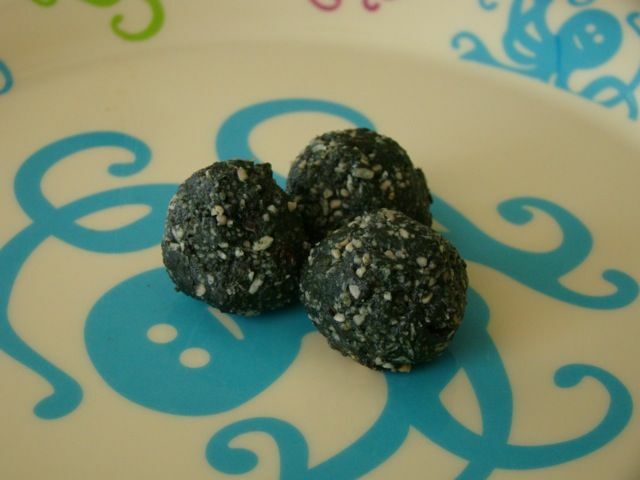 It is dairy-free, nut-free, gluten-free, raw, and absolutely delicious! 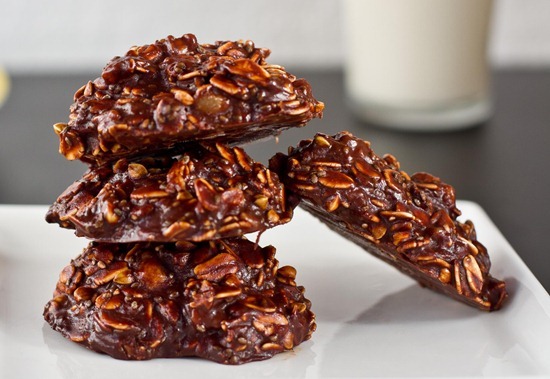 It has the rich, melt-in-your-mouth decadence of chocolate, yet is super healthy. And because it’s raw, it contains all the life-giving enzymes and nutrients that are lost through the cooking process. Spirulina is a blue-green algae found in freshwater ponds and lakes. It is very high (60%!) in complete protein, meaning it contains all eight essential amino acids. This is not so common in the plant world, so already spirulina is pretty special. In addition, it contains high levels of beta carotene, the rare essential fatty acid gamma-linolenic acid or GLA (which is also found in breast milk), vitamin B12 (lacking in many vegetarians because it’s mainly found in animal products), iron, magnesium, trace minerals and phytonutrients. A little less than a teaspoon of spirulina (3 grams) is the nutritional equivalent of two servings of vegetables. All this from a tiny microalgae? Amazing! Eating spirulina strengthens your immune system, helps generate new blood cells, improves cardiovascular function, supports healthy cholesterol levels, improves digestion, detoxifies the body, and reduces the risk of cancer through antioxidant protection. Up until now, smoothies were the main way to feature spirulina in my diet. But with the discovery of these super snacks, my horizons have been broadened and spirulina has found a new way to shine. Add remaining ingredients and pulse until sticky. You may need to stop the blender and scrape down the sides a few times. Form small balls, place on a plate, then place the plate in the fridge. You can also flatten the balls to look more like cookies. Let harden a bit; will still be chewy when done, but not gooey. Spirulina super snacks are great for kids, but if feeding to a child under the age of 1 year, just make sure to substitute agave or maple syrup for the honey . Honey can contain botulism spores that are lethal to infants. Adults and children over one year are safe. It’s also fine for breastfeeding moms, since the spores are killed on their journey through the GI tract, never making it into mom’s breastmilk.